Wer sind wir? - Das Profil - Overview - Arbeitskreis historischer Schiffbau e.V. The Association for Shipbuilding History (Arbeitskreis historischer Schiffbau e.V.) was founded in Munich in 1964 as registered charity in order to foster the exchange between those shiplovers and shipmodellers interested in history. Today, the Association counts around 900 members in Germany and world-wide. Members are not only individuals, but also some of the most important maritime museums around world. The history of shipping and shipbuilding, as well as naval history has developed into such a comprehensive and diverse field of cultural, technical, and political history, that even particular topical areas are difficult to cover by individuals. Exchange and collaboration are, therefore, indispensable. While many members of the Association are known experts in their field, they are by no means ‘professionals’, but rather ‘amateurs’ in the true sense of the term. Long-lasting dedication, archival and field-work often lead to works that will stand up to scientific criteria. The members’ areas of interest encompasses the whole time-frame in which humans are known to have ventured out onto the water, from prehistory to our days. Therefore, one is sure to find an expert for almost any topical area within the membership, who can provide well-founded insight and is willing to engange in conversation. In addition, the Association numbers many experienced shipmodellers, who are willing to share their knowledge with others. In order to avoid misconceptions: the majority of the members are normal hobbyist of all skill-levels, who spend their spare time on these maritime subjects. 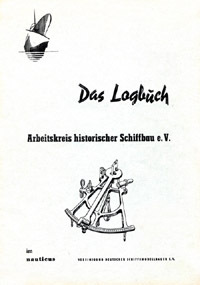 Since 1965 the Association has been publishing the quarterly DAS LOGBUCH, which is being distributed to members all over the world and is also being kept in various important museums and research establishment, notably in Amsterdam, London, Moscow, Paris and Washington. DAS LOGBUCH allows members to report on their research and their modelling projects, which are often based on extensive preceding research. The association also publishes in book-form, albeit in irregular intervals, special publications on selected topics, usually based on a member’s more extensive research work. You can request membership informally by writing to Bernd.Ahles@arbeitskreis-historischer-schiffbau. The memberships is valid for one calendar year.